Cbus Chic: What is Kapotas? Stebbins: Kapotas brand is for the minimalist who wants multi-functional products made with superior materials. Products you’re proud to take & put on the table at a meeting. I tend to lean towards leather as my base medium. I love the durability of leather and the look of it after years of wear and tear-as it patinas & becomes a part of the owner. As a designer I conceptually aim to connect yesterday’s hand-made quality and materials with todays technology. As a Product Designer & Minimalist I’m drawn to products that provide added function besides its primary use. In the middle you will find Kapotas. Cbus Chic: What does KAPOTAS stand for? Stebbins: Kapotas is the namesake of my late grandfather, George N. Kapotas, who immigrated to the US from Patras, Greece on an agricultural scholarship. He taught me many valuable lessons about life and he also inspired my passion for creating wearable products, which is why I want his name to live on through my work. I remember as a very young man seeing him put his pencil in a slit he had cut in the headband of his hat. (He was a sculpture and always had tools and pencils attached to him somewhere.) The child designer in me questioned- is that a pencil holder or a hat? I was amazed to see the hat could that also preform a function other then its primary purpose. I was hooked. This is the time I believe I fell in love with “wearable” products. Cbus Chic: What is the dual purpose wallet made of? Stebbins: Body is 100% genuine leather. Back is micro-suction made of acrylic foam. Cbus Chic: How did you come up with this idea? Stebbins: Most traditional wallets are bulky and take up a lot of space in your pocket or bag. After searching for a slimmer alternative, I was unable to find anything on the market that was high quality and served a dual purpose. That’s when I decided to design my own product that could serve as a slim wallet or be attached to the back of your phone for easy accessibility to your most used cards. 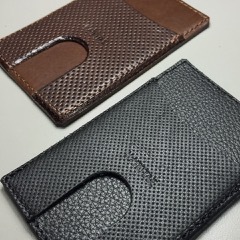 My goal was to make a more functional wallet for today’s modern consumer. Cbus Chic: When will readers be able to purchase/ start ordering and what is the cost? The Limited Edition brown Kapotas Wallet is available for purchase now, starting at $39.88+shipping , and you can preorder a black Kapotas Wallet, starting at $35.88+shipping (black will ship early January). Cbus Chic: Where can our readers go to learn more? Cbus Chic: Anything else our readers can expect?